So sorry everyone - very busy and facebook seems to get all my pix first- just found this great wallpaper this morning featured by a fellow blogger. Love it and will have to research where I can find it in Maine!!! 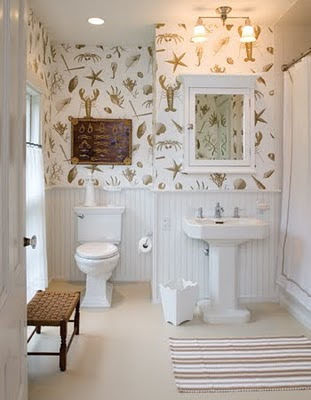 I think this house was featured in Maine Magazine- a sea captain's house completely redone and updated- gorgeous. This bathroom looks so similar to my guest bath that connects the two bedrooms. Since the tile on the floor will hopefully be done by next week when we return to Maine, we've got our work cut out for us!!! Here's to a summer of company and projects!! !